Re: What is the the total number of VRO posts to be filled up in Prakasam District? Total Number of V.R.A Posts in Prakasam District is 267Posts. the question paper of vro posts in telugu or english language ? please tell me. in prakasam dist how many VRO posts available in village wise? So this is helpline number for your District.So you can contact . Syllabus: The following are the syllabus for VRO exam. Notification Details: The following are the notification Details. >>Notification about the VRO post was release on 26 nov. 2012.
hello friends i have 90% material for vro please feel free contact me (mohanchenna143@gmail.com). how many vro posts for bc-b women in chittoor district? 1.What is the the total number of VRO posts to be filled up in East godavari District? 2.Iam from eastgodavari distrct,but can i apply vro posts for any other district vacancies ....or not...?please sir give me correct iformation. this is my Email Id Plz send me Reply....! " rhsdvprasadravi@gmail.com"
totally 75 posts are there in prakasham dist..
EDUCATIONAL QUALIFICATION - 12TH FROM ANDHRA PRADESH BOARD. APPLICATION FEE- RS 200 (RS 100 FOR SC/ST CANDIDATES) TO BE SUBMITTED AT ANY E-SEVA/MEE-SEVA/AP ONLINE CENTRE. list out the job vacancy available village names for both VRO and VRA in prakasam district. Totally 75 posts has to be filled up in prakasham district. -->> There is VRO or village Revenue Officer recruitment in Andra Pradesh state. -->> This post is releted to the Land Revenue Department. -->> The recruitment consists of total 1172 posts. 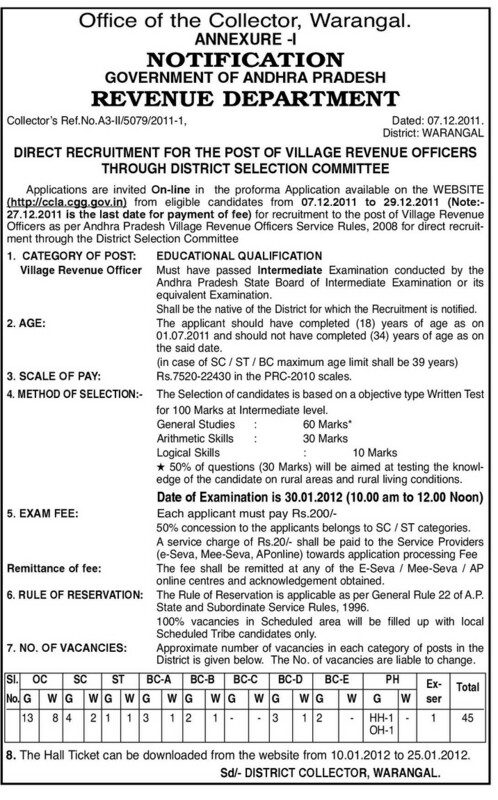 -->> There is different vacancies for all districts. -->> The district collector of each district is authorized to conduct the exams. -->> There is vacancies of total 75 posts of VRO in Prakasam district. -->> The exam is now on 19th of February, 2012. -->> Candidates candownload the hall tickets for sitting in the exam. Syllabus for VRO Examination: The following are the Syllabus for VRO Examination. What are the qualification needed for SI Post? Total number of PH(OL) category candidates of sister grade II which are selected for interview?